System: Debian/Ubuntu/Fedora. Might work for others as well. 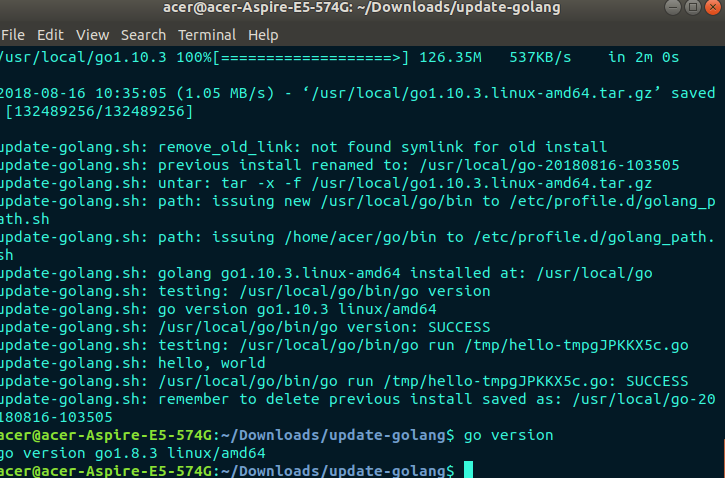 As mentioned here, to update a go version you will first need to uninstall the original version. Go to the downloads page and download the binary release suitable for your system. $ echo $PATH | grep "/usr/local/go/bin"
Thanks @udhos! That script worked perfectly! Thank you @nikhita for sharing and @udhos for the script. You are awesome# @nikhita ! why its still showing as 1.6.2 after running script? am i doing something wrong? Will the script work on windows7 as well? pls confirm..
@udhos it works like a charm! @saifiifazal I have the same problem. It's showing the old version even after running the script. Remove your previous install first? @udhos your script works perfec. Thanks! @udhos Thanks for the script! Thank you @nikhita and @udhos ! Thanks for this gist. It's funny ! after completing all the tasks you find the script of the first comment. It would be nice if it was included directly in the gist. Thank you. It always grabs the latest version and overwrites whatever is in your path (based on which go). I've only tested it on Linux since that's all I have access to. Let me know if you have any issues with it and I'll fix it. I was trying to tweak @fearphage one-liner. Because my mac (sierra 10.12.6) does not support the -V sort option! Then I saw @fabienthetis comment!!!!! @udhos, Thank you very much! @fearphage It works for me on Ubuntu 18.04. Thank you so much.